If you are looking for a unique, non-traditional addition to the interior or exterior of your home, Kathy Shore Nursery's Boxwood Wreath is perfect! The Boxwood Wreath's shiny, full leaves will bring a true touch of elegance and class to any setting. Available in all sizes, the Boxwood Wreaths from Kathy Shore Nursery will look amazing adorning your front door, hanging from your driveway lamp, or draped using ribbon from your dormer windows. Kathy Shore Nursery's fresh, hands-on approach to wreath making ensures a beautiful product every time. Boxwood boughs are cut daily and each Boxwood Wreath is crafted by skilled workers in a climate controlled environment. Boxwood Wreaths will last the entire holiday season and well into the winter months. 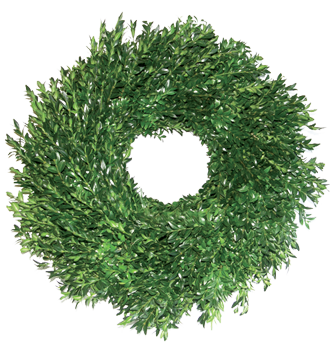 The Boxwood Wreath is a wonderful way to decorate your home! Kathy Shore Nursery offers the Boxwood Wreath along with Fraser Fir Christmas Tree Wreaths and Mixed Wreaths which feature a blend of White Pine, Fraser Fir, and Boxwood boughs. Call Kathy Shore Nursery for more information on our Wholesale Christmas Wreaths and wholesale shipping options. We also feature beautiful North Carolina Christmas Trees, Handmade Luxury Christmas Garland, and will be happy to palletize your order ensuring quality upon arrival and saving you money at the same time!